As an American, I naively think of British and English as exact synonyms. I know I'm wrong, but I just don't know in what way. I am vaguely aware that people in the UK hold strong opinions about one or the other term and how it is applied, and using one instead of the other has dire social implications. So there is geography (Britain vs. England), but more importantly the adjectives British and English, and those adjectives each one by themselves, may mean different things in different contexts, and depending on the speaker and the listener. Can anyone explain the nuances of the differences as used by those who might consider themselves English (or British, if that's an acceptable usage)? How about by the non-English/non-British (again if it's appropriate to use such terms). The country of which I am a citizen is the United Kingdom of Great Britain and Northern Ireland. Great Britain is the largest of the British Isles and is home to England, Scotland and Wales. I was born in England and, apart from several extended periods abroad, have lived my life in England. That makes me ethnically English and politically British. Although Great Britain is a geographical term, British describes nationals of the whole of the United Kingdom and Britain is sometimes used to mean the United Kingdom. Things are often perceived differently abroad, and even by some of the British themselves. The whole political entity is frequently referred to as England, even though England is only a part of it. That doesn’t usually bother the English, but it might bother the Welsh, the Scots and the Northern Irish. The best policy is to call the country the United Kingdom or, less formally, Britain. Call the people British, unless you know them to be English, Welsh, Scottish or Northern Irish or something else. The title ‘The United Kingdom of Great Britain and Northern Ireland’ raises an interesting linguistic, as well as political, point. Syntactically, it’s ambiguous. Is it ‘(The United Kingdom) of (Great Britain and Northern Ireland’) or is it ‘(The United Kingdom of Great Britain) and (Northern Ireland)’? In ‘The Isles: A History’, Norman Davies traces the various titles by which the isles have been known. From 1660 to 1707 it was ‘The Kingdom of England and Wales’. The union with Scotland in 1707 gave us ‘The united Kingdom of Great Britain’. Meanwhile, there was a Kingdom of Ireland from 1660 to 1800. In 1801, Ireland was included in ‘The United Kingdom of Great Britain and Ireland’. That state of affairs lasted until 1922 when Ireland divided, allowing the six northern Irish counties to become part of ‘The United Kingdom of Great Britain and Northern Ireland’. The original ‘united kingdom’ of 1707 was so called because it united England (with Wales) and Scotland. The addition of ‘Ireland’ in 1801 and of ‘Northern Ireland’ in 1922 can therefore be seen as mere accretions to an already united kingdom. However, the grammatical ambiguity allows the alternative interpretation of all components of the State being united under a single crown. A good example, perhaps, of Engli-, sorry, British, compromise. 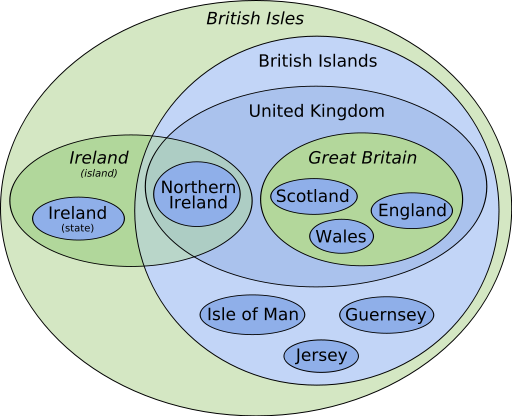 From the Wikipedia article Terminology of the British Isles, see images of the British Isles, the United Kingdom, Great Britain, and England respectively. See the Euler diagram for completeness (the blue ones are legal entities, and green ones are geographical). Britain (and thus the adjective British) refers geographically to the whole of the island on which England, Wales, and Scotland lie. By extension, when the United Kingdom held onto the northern part of Ireland, they too were subjects of the British Empire. (It was a British empire, where the English were the dominant partners of the United Kingdom of Great Britain and Northern Ireland). The English (descendants of the Angles who come originally from Saxony i.e. northern Germany) comprise the bulk of the island, including London (Shakespeare), Manchester (soccer hooligans! ), Liverpool (the Beatles! ), and the like. (Cornwall is technically English, but just barely). The English are also well known for their inedible cooking and bad dental hygene that renders said food capable of being passed through the mouth into the stomach without imparting taste. Please Note: I'm purposely having some fun here with the stereotypes, not because I believe them, but because I'm trying to add a hint of connotation and possibly humor to the narrative. The Welsh (Cardiff and the site of every quarry made popular in Doctor Who) and the Scots (Edinborough, Glasglow, Loch Ness, and the only accents that Americans can truly make fun of) are "native" to the islands — think of them as Celtic or Gaelic or Picts (indigenous to the island, insofar as they were here before the Romans.) — and have the reputation of being a little bit 'hick' or 'redneck' as we say in the states when compared against the English. Culturally, the English would be more "refined," in that they were the ones who conquered everyone else, and nothing says refined like having killed off and subjugated all your neighbors. As an aside, the Queen's son is currently the Prince of Wales — think of it as a consolation prize, and I think you'll get how the English perceive the Welsh. To understand being British over against being English you have to realize that everybody on the island of Great Britain (again, the big island that ain't Ireland!) and those Englishmen who live in Northern Ireland are all subjects of the same queen — the ruler of the United Kingdom (hence the UK). To be British is not to be European but distinctly part of the island. You need to invest the five minutes it takes to watch this video on YouTube. It is a brilliant and thorough explanation of all of the terms relating to the geographical and political terms related to Britain, England, etc. If somehow the YouTube link dies, you can see the entire script for this video on the author's blog. Unlike England, Scotland, Wales and Northern Ireland, Great Britain is a geographical term rather than a political term. With respect to the OP's specific question, there are precise definitions of the places England and Britain and therefore precise definitions of their adjectives English and British. However, with people using language imprecisely, as they do, there are lots of opportunities for confusion which could be interpreted as nuance, when in fact these subtle differences are errors in communication. No, “English” and “British” are never exact synonyms, and please don't use them that way. The most important rule: only call someone English if you know they're English. If you call them English and they're Welsh, Scottish or Irish, it's not only incorrect, but for some is deeply insulting. This is in part due to the historical English oppression against the Welsh, Scottish and Irish that isn't easily forgotten. The safest thing when you don't know is to call them British. Still, some Welsh, Scottish and Irish would rather not be associated with a term including England, but it's better than getting it wrong and insulting them with "English". In a similar vein, only use England as a generic country name when you know you specifically only mean England. Otherwise you're excluding a lot of people and places. If you're talking about English pirates, do you mean to exclude the Welsh Captain Morgan? If it's English engineers of the industrial revolution, what about the Scottish James Watt? English punk: so no Northern Ireland's Stiff Little Fingers and The Undertones? Use the UK or [Great] Britain if that's what you really mean. The preferred option really varies on a person's political standpoint and sense of national identity. I would say that typically Welsh or Scottish people would prefer to be referred to as such rather than as British due to the strength of their nation's culture. In England this is likely to be more dilute, resulting in a greater acceptance of the British identity. Having said that, I would say that I am English rather than British! I certainly agree that the potential for a social faux pas is high and I personally would always side with the smaller geographical unit of English, Welsh or Scottish rather than British. Then again it must also be noted that citizenship and nationality is exclusively British. Officially nationality of anyone born in the UK is British and it would be incorrect to be referred to as an "English Citizen". Regarding people from Northern Ireland, I would consider Irish as referring to citizens of the Republic of Ireland (geographically southern and central Ireland). Unfortunately, I am doubtful that there is a definitive answer as to which is appropriate as it will depend almost entirely on the personal views on the reader. For people not from Britain and Ireland, the safest way through the minefield is to initially use the term "British" for someone who is English, Welsh or Scottish. They may correct you, but you probably won't cause offence. If they're from either the Republic of Ireland or Northern Ireland, use the term "Irish". There is an outside chance that a Unionist from Northern Ireland may slightly baulk at the term, but in this case they'll just correct you. If you're not sure if someone is British or Irish, just ask (especially if there's a possibility of them being Irish). 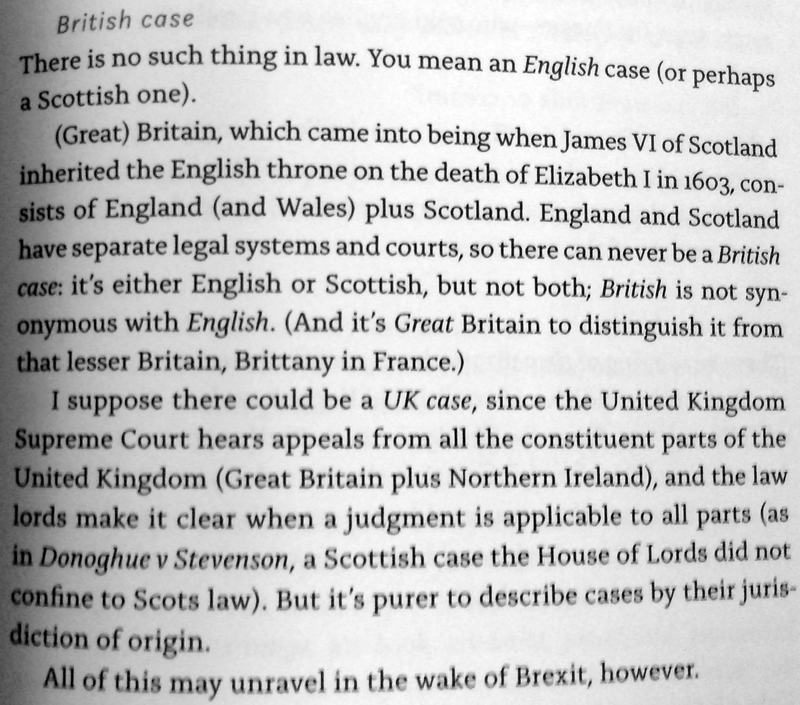 It's confusing but easy enough to understand that Scots, Welsh, English and Northern Irish all fall under United Kingdom citizenship, or they are called "British subjects". Some people can never seem to get it into their heads that British is not synonymous with English. To be fair, it is confusing because Scotland, Wales, English and Northern Ireland are considered separate countries but all share the same passport and then the whole Great Britain vs. UK thing makes it even more confusing because British subject status refers to the entire United Kingdoms which is short for the United Kingdom of Great Britain AND Northern Ireland. So technically GB is English, Scotland, Wales; but with Northern Ireland they make the UK. Most Irish people just call themselves Irish so we might assume they are from the Republic of Ireland. There have been some great answers to this. Hugo explained it well, when he wrote "No, “English” and “British” are never exact synonyms, and please don't use them that way." That's true. Affable Geek alluded to an important point, when they wrote "(Cornwall is technically English, but just barely)." Technically English in that this is a status that has historically been imposed on it, by England. Many Cornish people in the past and today, have considered themselves as Cornish and not English. They are Celtic, with a history and language (even though they speak English, as well) that are not of England. Therefore, not English in the true sense of the word. Basically, English is just for those things that are of England only. Including the language, even though it is used in other parts of the world, it is only of England. British, is for things that are of the entire United Kingdom, generally. So, British includes English things and others. As an American, I naively think of British and English as exact synonyms. I know I'm wrong, but I just don't know in what way. I am vaguely aware that people in the UK hold strong opinions about one or the other term and how it is applied, and using one instead of the other has dire social implications. So there is geography (Britain vs. England), but more importantly the adjectives British and English, and those adjectives each one by themselves, may mean different things in different contexts, and depending on the speaker and the listener. Can anyone explain the nuances of the differences as used by those who might consider themselves English (or British, if that's an acceptable usage)? How about by the non-English/non-British (again if it's appropriate to use such terms). I'm British. I know that this question is an issue for a lot of people in the world. It can be explained simply. Most people are familiar with the words England and English but, are not as familiar with the other words, like United Kingdom, Britain, British, Scottish, Welsh, Northern Irish or Cornish. Therefore, they assume that England and English apply to everything of the UK. It is an assumption based on a lack of information. A simple way to understand it, is to compare the UK to the USA. The USA is a country made up of states. Each state, with a different name. People can be New Yorkers or Californians and they are Americans. However, not all Americans are New Yorkers or Californians. For the UK, replace the word states, with the words "home nations". Then, replace the state names with the names Scotland, Wales, England, Cornwall, Northern Ireland. Scottish, Welsh, English, Northern Irish and Cornish are the words for describing things that are of each of these home nations. People can be English and they are British. However, not all British people are English. I know that the UK and the USA are not entirely comparable but, for the purposes of this subject, the comparison is a suitable one. There is one other point that is worth making, in regards to this subject. The word British, does not only mean things or people that are of the UK. It also applies to the things or people that are of the overseas territories of the UK. Whether colonies, dependencies or anything else; these are territories that belong to but are not part of, the UK. These include examples such as the Falkland Islands and Gibraltar. Even the Isle of Man, which is close to the UK but, still not part of it. These are all British overseas territories and their peoples are British citizens. There is a risk that questions like this get bogged down in the pedantry of states and laws, and don't answer in a broad enough way that someone might surefootedly use the terminology and understand what is meant by what is said. I see that in the other answers, so want to respond here, despite this question already having many answers. The modern settlement is increasingly a group of disparate nations (England, Scotland, Wales, etc), each with distinct, but closely related, cultural, historical, familial, etc, ties. They live within a single state (UK, Britain, etc). I imagine that the situation is somewhat analogous to first nations settlements some in other countries (but not of course a strong historical analogy, this is just a menmonic). While there are subtle and important distinctions within these terms, very few people know them, even those who embody them. The crucial distinction is someone who wants to be identified with the culture, music, traditions, etc, of their nation (a Scotsman, Englishman, Welshwoman, Cornishwoman, etc); and someone who wishes to emphasize the unity of the whole state and its political institutions (and maybe they believe that the cultural distinctions are minor), they are British. So someone in Scotland might want you to call them Scottish or British, (but not the other), and so on. It's their choice. In practice, I believe you're less likely to get pulled up for calling someone English, Welsh, Scottish, etc, than calling them British, just by numbers. But we all are burnt, even us natives: you just have to roll with it, and remember, :-) . The English are in the privileged position of having been considered the senior partner historically, and so tend not to see what the fuss is about, as they can go about their business largely ignoring the other nations, and so are prone to mixing and matching and so confusing foreigners. That is much, much less likely of someone who's Scottish or Welsh. I am English, from England. British, means 'from Britain' which is composed of England, Scotland, or Wales. These were originally three separate countries, which are in a kind of alliance. People from these countries still think of each one as being a country, even though to you, they may appear to be like 'regions'. British means - from any of those 3 countries. English means - from England. If you ask me 'are you British'? I might reply 'yes, I am English'. Because, as I say, we think of ourselves as coming from our individual country - ie England, Scotland or Wales. So I am going to tell you my country, when you ask. Being called 'British' is really only for passport application or immigration. If you call me 'a brit' or talk about 'the brits' I might also get offended - that sounds a bit rude to my ears. If you accidentally call a Scottish person 'English', or a Welsh person, 'English' they may get offended. They will bellow 'noooo I'm Scot!' Or lilt 'no, I'm from Wales!'. You probably won't go the other way and ask an English person if they are Welsh or Scottish - due to the English language being so popular that makes people think that Britain IS English or is - England. But it's not, it's Scotland and Wales as well. I've left out beautiful green, friendly Ireland because its a bit complicated to explain and has changed also. The reason why people may get offended if you wrongly name their country is - boundary issues, changes in which country is part of what, individual identity, and history. And discussions about 'who should be a part of what' tend to be ongoing... and contentious. England, having the governmental control over Britain, is sometimes resented by people from Scotland and Wales, who now have their own parliaments too, and there are people in those countries who want devolution and independence from England. This is why, if you ask an English person if they are Welsh or Scottish, they may not mind. But the other way round - they may. PS Cornwall, that long toe of England heading South West, is really a country too, a beautiful one, inhabited by the Corns. They may also baulk at being called 'English'. They are 'Cornish'. I thought to refer to a book that expounds the legal difference. See Neil Guthrie DPhil English (Oxon), LLB (Toronto)'s Guthrie’s Guide to Better Legal Writing (2017). p. 95. Not the answer you're looking for? Browse other questions tagged british-english connotation ethnonyms or ask your own question. What should I call the English spoken in UK? What is the proper adjective for the UK? What's the difference between England, Britain, and the United Kingdom? Is it ever correct to call someone “Great British”? Why does Britain use “Way Out” rather than “Exit”?